The present study is part of an ongoing series of experiments aimed at delineation of the neural pathways that mediate fear-potentiated startle, a model of conditioned fear in which the acoustic startle reflex is enhanced when elicited in the presence of a light previously paired with shock. A number of cortical areas that might be involved in relaying information about the visual conditioned stimulus (the light) in fear-potentiated startle were investigated. One hundred thirty-five rats were given 10 light-shock pairings on each of 2 consecutive days, and l-2 d later electrolytic or aspiration lesions in various cortical areas were performed. One week later, the magnitude of fear-potentiated startle was measured. Complete removal of the visual cortex, medial prefrontal cortex, insular cortex, or posterior perirhinal cortex had no significant effect on the magnitude of fear-potentiated startle. Lesions of the frontal cortex attenuated fear-potentiated startle by approximately 50%. However, lesions of the anterior perirhinal cortex completely eliminated fear-potentiated startle. The effective lesions included parts of the cortex both dorsal and ventral to the rhinal sulcus and extended from approximately 1.8 to 3.8 mm posterior to bregma. Lesions slightly more posterior (2.3-4.8 mm posterior to bregma) or lesions that included only the perirhinal cortex dorsal to the rhinal sulcus had no effect. The region of the perirhinal cortex in which lesions blocked fear-potentiated startle projects to the amygdala, and thus may be part of the pathway that relays the visual conditioned stimulus information to the amygdala, a structure that is also critical for fear-potentiated startle. In addition, the present findings are in agreement with numerous studies in primates suggesting that the perirhinal cortex may play a more general role in memory. Rosen, Jeffrey B. et al. 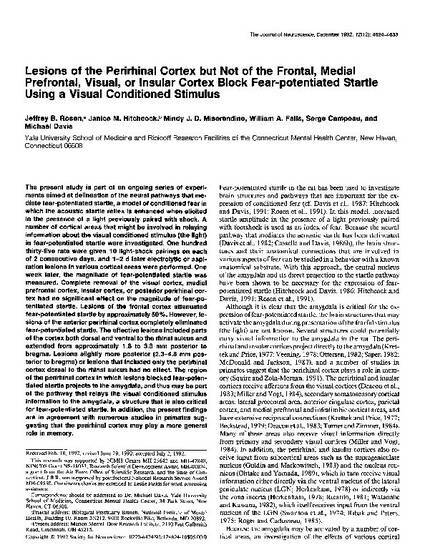 "Lesions of the Perirhinal Cortex but Not of the Frontal, Medial Prefrontal, Visual, or Insular Cortex Block Fear-potentiated Startle Using a Visual Conditioned Stimulus." The Journal of Neuroscience 12.12 (1992): 4624-4633.